Chistina, our talented teammates and I are very happy to welcome you to our 47th Challenge. Already, almost a year since Christina and I challenged ourselves for the first time ! I particularily love this week's theme: Among my favourite things... I sincerely tried to put most of the little things in life that make me very happy! For instance, my ponytail, ladybugs, butterflies, swing, bows & ribbons, cars, trees and flowers, the color red, if you look closely, you will find them all ! Nous avons le plaisir de vous accueillir à notre 47e défi. Depuis presqu'un an maintenant, que Christina et moi, nous nous lançons des défis chaque semaine! J'aime particulierement le thème de cette semaine: Parmi les choses que j'aime... J'ai bien essayé d'en mettre le plus dans ma carte, de ces petites choses qui me font bien plaisir dans la vie: ma queue de cheval, les coccinelles, les papillons, les boucles et les rubans, les balançoires, les voitures rouges, les arbres, les fleurs, la couleur rouge, si vous regardez attentivement, vous allez les repérer! 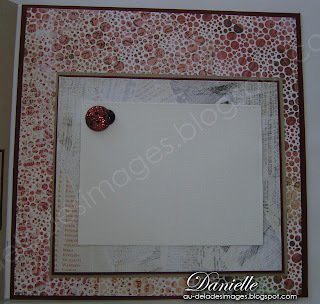 I stamped my images on Bristol paper, and colored with Prismacolor and Taltine. I used the mask technique to overlay the tree and the car. 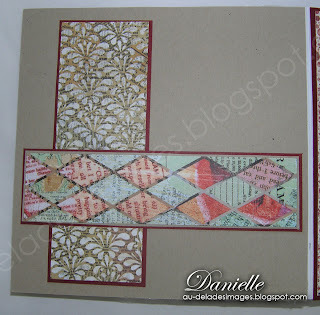 The wonderful paper are from Basic Grey, OUt of Print collection (available from Scapbook ta vie). Mes images sont imprimées sur Bristol et colorées avec Prismacolor, et taltine. J'ai utilisé la technique du masque pour superposer mes images. Mes papiers sont de la collection Basic Grey, Out of Print, disponible chez Scrapbook ta vie. Thank you very much for your visit, your comments always warm my heart. 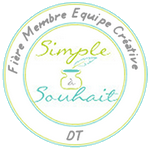 I would like to invite you to visit my very talented friend and teamates, to admire their fabulous creations. wow ta carte est vraiment belle et pleins de petit détails... un pure délice!! WOW...Dan, you did a spectacular job coloring with those Prisma pencils!!!! I am impressed!!!! of my favorite Tildas on the swing! 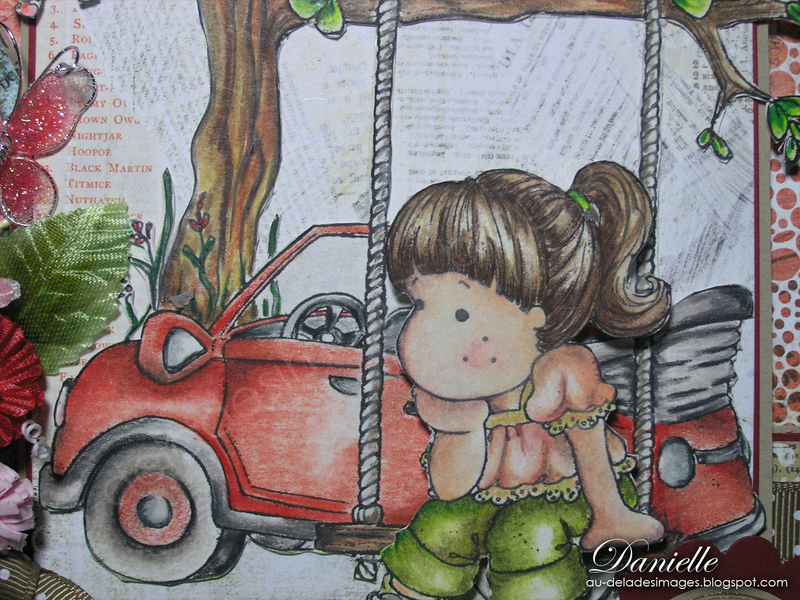 Love the car and tree in the background....beautiful job masking! This is a totally gorgeous creation. 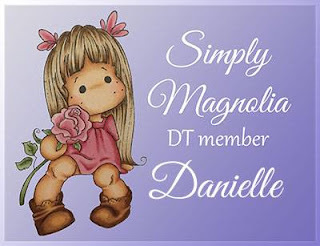 Danielle you never ever cease to amaze me!!! Only you could mask that many images with such a beautiful result. You are so stinkin clever!!! Your card is beautiful! I love everything !!! You are clever and original and talented and an awesome friend!!!! This is what I call a knock your socks off card Danielle. Again, not only do you create a masterpiece, you tell a story and now you have added a new twist - let' play find the objects! You see how Tilda looks right now? That is the way I look while I gaze at your card. Ta carte est superbe! j'Adore, il y a tout plein de détail à regarder. bravo! Quelle belle mise en scène Danielle! On voit que tu es une fille de nature et qui prend le temps de regarder autour de soi!! Chose que l'on devrait tous faire...s'arrêter et prendre le temps de faire et regarder ce que l'on aime! Toutes mes félicitations encore une fois, tu peux dire "mission accomplie". Wow Danielle! this is gorgeous. I love how you have got the car in between the swing and the tree. Very clever masking on this one. I love it. 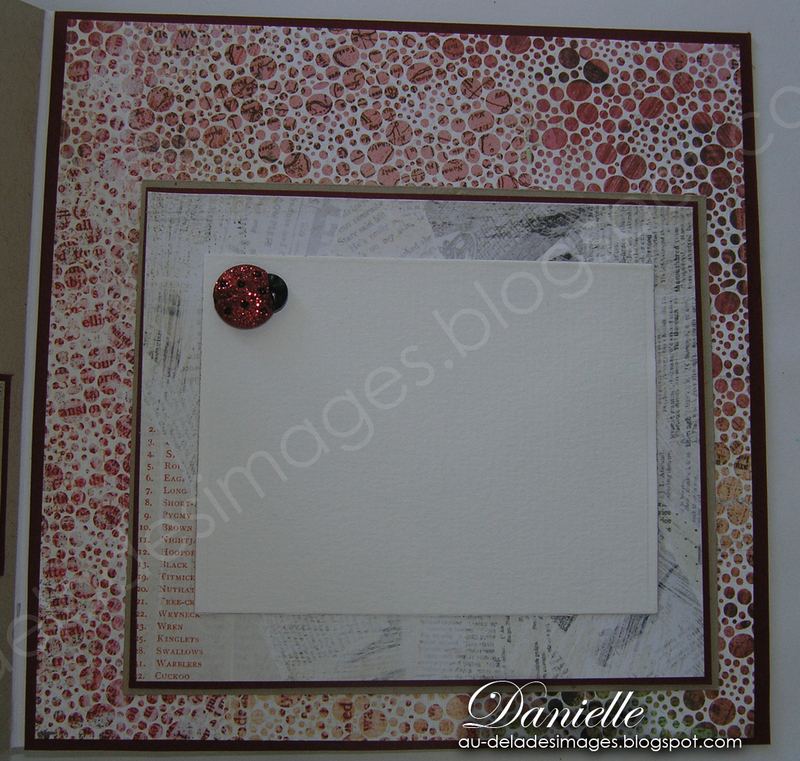 How fitting that you used your favorite things on one of my favorite cards of yours! This is just gorgeous!!!! Very.....very beautiful Danielle. So much work and such a great result. I like it all. Thanks for sharing your creations. 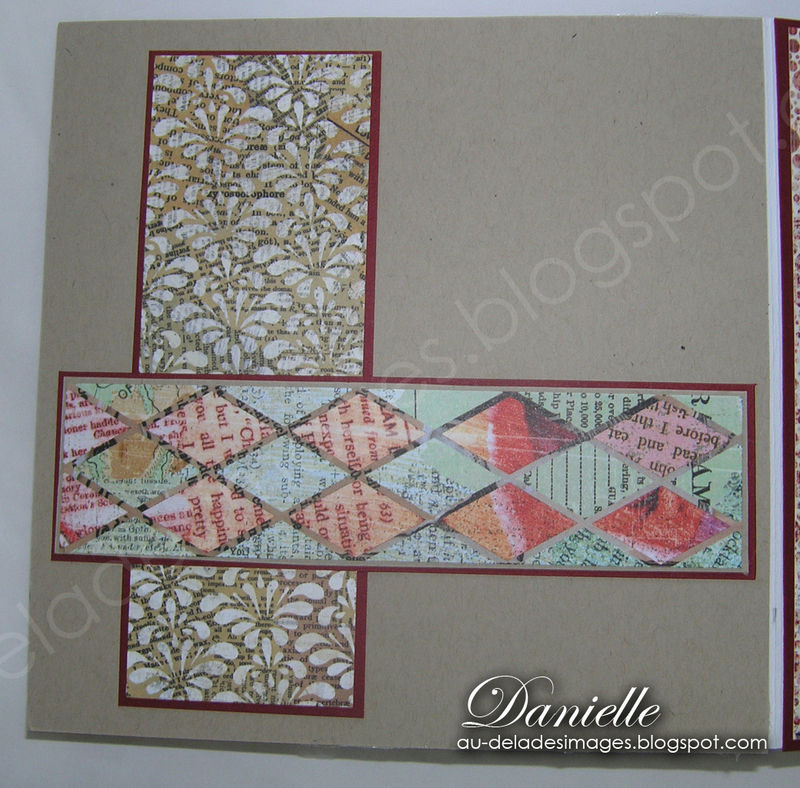 Another splendid "scenic" card creation, Danielle! I love the placement of the images...nice depth. Makes me want to find a swing hanging from a tree, and sit and enjoy the summer breeze! Beautiful card and coloring. . . as always! Ooh Danielle! Another gorgeous scenery!!! Now what is Tilda thinking about?!!! She's so heavy in thought sitting on that swing over there! hehe!!! I love your colouring and masking technique! And those flowers are divine!!!! STUNNING once again!!!! I just love this card. You create really nice scenes. Oh my gosh Dani, are you sure you couldn't get anything else into that card?? 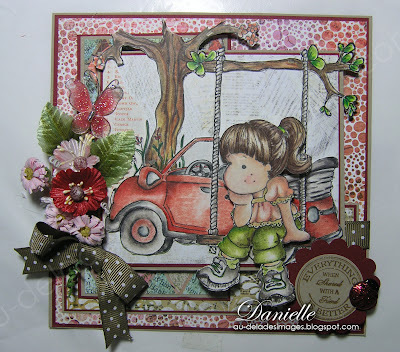 An amazing card and beautiful one at that.. Love all the accessories you have included and the layout you have incorporated them. You have as usual, done a gorgeous job... and I might add, you sure do love lots of things!!!! What a wonderful scene you created!